When you think of the percentage of our lives we spend at work - as well as the high-pressure tasks we deal with there - it's unsurprising that we can all sometimes run into difficulties getting along. When professional relationships start to crack, mediation is often the best way to resolve things - and here we're going to look at how we as HR professionals can best intervene in these scenarios. Working in HR is a lot like teaching in a high school at times - we tend to get called in when a situation has got past the point where untrained personnel can reasonably be expected to resolve it. There are all kinds of things involved here - including bullying in the workplace and potential mental health issues. Office politics are a major reason that employees leave their jobs. So what do you do? What are the skills we should deploy in order to quench the flames of a dispute before it gets nasty? Effective mediation takes empathy, skill, and a degree of intuition - all of which are skills you should aim to develop as a HR professional. First you need to find out what's actually happened. This process is likely to start with the person who brings the issue to your attention - who may or may not have been involved with any incident itself. If you're not already familiar with them, then you should review any relevant guidelines that exist on dealing with this kind of situation within your organisation - and ensure that you stick to them. Next, it's time to make a list of everyone who was directly involved in the incident, and make sure you speak to them. The best way might be to do this separately, or it might be to do it as a group - and this is something which will depend on the situation itself. At all times, you must remember that you're a mediator and nothing else - so keep yourself calm and detached. A core concept in mediation is that each party gets an opportunity to voice their opinion - no matter how clear-cut the situation may appear on the face of things. It's important for everyone to have a say. Once you've got the idea of what went on from the parties involved, you should speak to people who weren't, but who witnessed whatever it was that led to the situation. These people should have less motivation to mislead you about the facts, so you should end up getting a fairly reliable gist of whatever it was that went on. This is true of all things in business, and is a core principle that will help you a lot. Always go for a win-win solution if one is possible. Generally there is one - and the more you look for the positives in seemingly negative situations, the more you will notice them. By going for a win-win, you'll be ensuring the best outcome overall - because everyone will walk away with some kind of benefit. The situation may actually be an opportunity to strengthen a relationship between two people if it is played out in a positive manner. Above we outline a best practice for the conflict resolution process, but what of the conversations themselves? Well asides from remembering to remain impartial at all times, there are a number of things you can do to help keep things on track. The first thing is to know your objectives as soon as possible. This will give you a target to steer the process towards - allowing you to achieve the best outcome for all parties concerned. Listen out for hints in people's dialogue that can tell you more about where they're coming from. Bear in mind that statements including words like 'always' or 'never' tend to indicate a degree of exaggeration. Situations are very rarely clear-cut enough to warrant the use of such a term. Encourage participants to deal in facts, rather than value judgements. Rather than their indicating to you why they believe someone acted a certain way, try to steer them towards simply telling you what happened - allowing you to inquire with the other party as to any motivations. This is a healthier and less-stressful way to go about things. 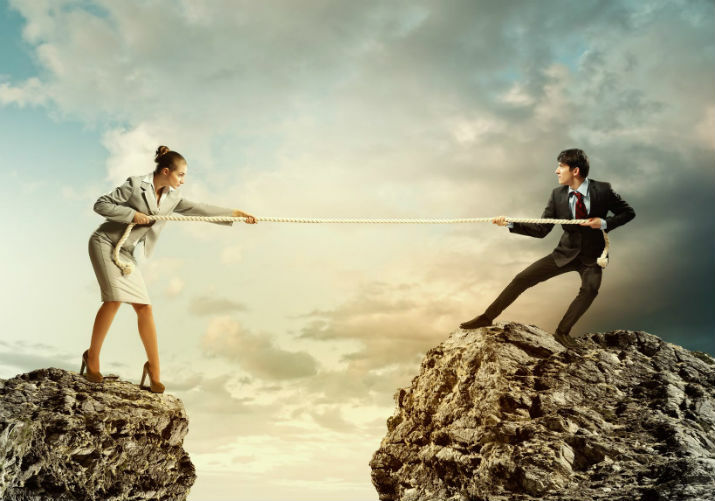 This short article has provided an overview of the most effective ways to mediate difficult situations between employees, which will help them to reconcile their differences in the majority of cases. Whilst there's no one path through a situation such as this (mediation is as much an art as it is a science), it is still important to keep your organisation's internal guidelines in mind at all times throughout the process. Effective mediation takes empathy, skill, and a degree of intuition - all of which are skills you should aim to develop as a HR professional. Whilst some people will naturally be better at this than others, hopefully we have shown that following a logical, systematic process means that there is no need to feel intimidated by this critical HR function.